When I require wisdom, I find myself going to the Dickens. Earlier this year I quoted from Charles Dickens' A Christmas Carol, and damned if I'm not going to do it again. Because sometimes my own words seem affectless and dingy when I need them most to shine, but his never do. So, for a friend who is choosing to shut out not only Christmas but the people who celebrate it, here are words that are better than mine. "What else can I be," returned the uncle, "when I live in such a world of fools as this? Merry Christmas! Out upon a Merry Christmas! What's Christmas time to you, but a time for paying bills without money; a time for finding yourself a year older, but not an hour richer; a time for balancing your books and having every item on 'em through a round dozen of months presented dead against you? If I could work my will," said Scrooge, indignantly, "every idiot who goes about with 'Merry Christmas' on his lips, should be boiled with his own pudding, and buried with a stake of holly through his heart! He should!" "There are many things from which I might have derived good, by which I have not profited, I dare say," returned the nephew: "Christmas among the rest. But I am sure I have always thought of Christmas time, when it has come round - apart from veneration due to its sacred name and origin, if anything belonging to it can be apart from that - as a good time: a kind, forgiving, charitable time: the only time I know of, in the long calendar of the year, when men and women seem by consent to open their shut-up hearts freely, and to think of people below them as if they really were fellow-passengers to the grave, and not another race of creatures bound on other journeys. And therefore, uncle, though it has never put a scrap of gold or silver in my pocket, I believe that it has done me good, and will do me good; and I say, God bless it!" 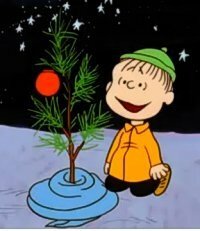 Christmas, my friend, is like the little tree Charlie Brown picked out. As Linus said, it's not so bad; it just needs a little love. To all my Drunkards, whether you keep Christmas or not, I wish you a little love this season.